Li-Fi is a newer term in wireless communication. Even if it has been around for 7 years, most of the people still do not know about it. So, I decided to write about Li-Fi in detail. In this article, I will try to tell you everything you should know about this upcoming high speed wireless communication technology. LiFi or light fidelity is a wireless communication technology that transmits data between devices using light. In present state, it uses light-emitting diodes (LEDs) for data transmission and it uses same LED light bulbs that can be found in most of the homes and offices. LiFi uses same 802.11 protocols, but it uses ultraviolet, infrared and visible light communication in place of radio frequency waves. As I said, it uses light to transmit data. So, it uses LED bulb to receive and transmit the data. LED is a semiconductor device and got a switching properties. This property is used to transmit data. LED lamp is powered through an LED driver that gets information from the Internet server. It encodes the data and based on this data, the lamp will flicker at a very high speed. It cannot be noticed by human eyes, but Photo Detector on the other end will be able to read all the flickering. It will then decode the data after Amplification and Processing. Then it will transmit the data. As light travels faster ten thousand times faster than Radio waves, it will offer much faster communication. To make it clear, you should know that frequency of Radio waves are just 300 Giga hertz but light can go up to 790 Tera hertz. Researchers at Oxford University managed to achieve the speed of 224Gbps using Li-Fi network. This is much faster than existing WiFi network’s speed. 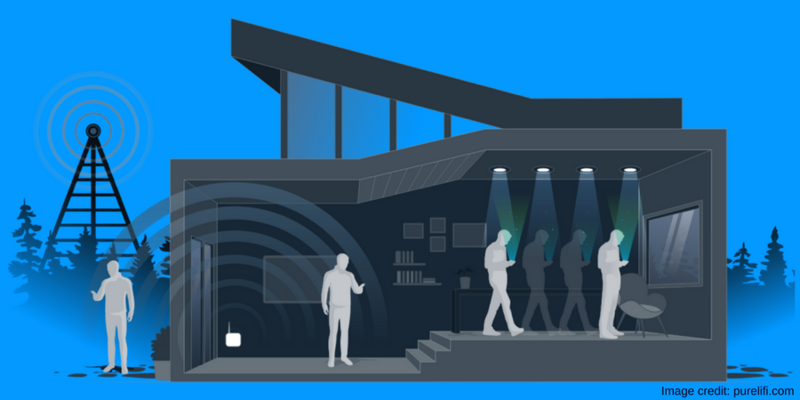 For connecting to LiFi network, your device should also get a LiFi adapter for receiving Li-Fi enabled light signals. There are companies like Pure LiFi are also offering Li-Fi dongle that can be plugged into USB and read data from any Li-Fi enabled light. Oledcomm also launched its a product named MyLiFi that brings the LiFi to your computer via USB port. They showcased their device at CES 2018. Unlike radio frequency waves, lights cannot penetrate through walls and doors. So, it requires a direct line of sight to transmit data. It makes it secure as people present in room can only connect to the network and no signal will go outside until Windows and doors are covered. Another big advantage is that it does not interference in sensitive electronics. So, it is safe to use in hospitals and aircraft like sensitive environments. You need to place capable LED bulbs throughout the home and these must be on all times to provide connectivity. Connection range will also be smaller and it will not be ideal for home networks. Even if we are close to LiFi technology, it will still take years to completely replace the existing WiFi network. Indian government has also started testing LiFi for making Internet accessible to difficult territories where reaching to Fiber is not possible. Few internet providers in Dubai have already tested the tech to offer consumers high speed video streaming and Internet. So, we are already on a fast track. I am expecting this tech reach consumers by 2020. If you have anything to say or ask, you can always leave it in the comment.